In this experiment, you will explore the basic principles and methods of tissue eneering. The goal of tissue engineering (also called regenerative medicine) is to repair tissues damaged by acute trauma or disease. Repair is typically stimulated by insertion of a porous scaffold at the wound or disease site; the scaffold may carry relevant mature or progenitor cells, and in some cases also soluble growth factors. Tissue regeneration shares many characteristics with natural tissue development, including the importance of appropriate cell differentiation and phenotype maintenance. 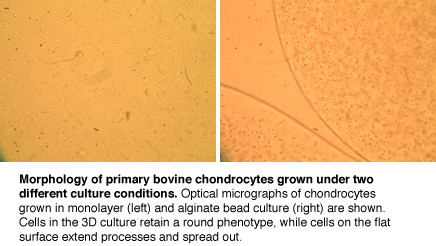 We will examine the effect of physical and chemical manipulations to the cells’ environment on primary chondrocytes grown both in monolayer culture and in alginate beads. Specifically, we will assay the viability, genotype, and protein production of these cartilage tissue cells. I gratefully acknowledge Professor Alan Grodzinsky and several members of his lab group (particularly Rachel Miller), for their technical advice and stimulating discussions during the development of this module. Note: 1 week between day 2 and day 3. This page was last edited on 29 January 2008, at 08:45.